A Carolina Beach couple makes fresh products a priority. April Sussman spends friday mornings packing produce into picnic baskets. She sticks in a sheet of paper that outlines the contents and suggests a recipe. Then she climbs into her SUV and delivers the baskets to 50 local homes. 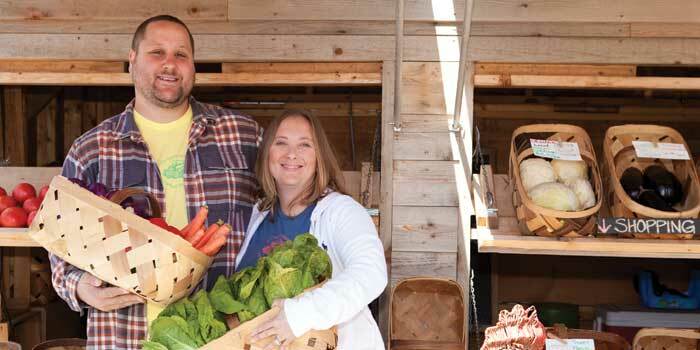 April and her husband, Max, own The Veggie Wagon, a delivery service and produce market in Carolina Beach that offers local meat, dairy, produce, baked goods, and seafood. It’s an uncommon model in today’s supermarket world, but older customers find it similar to the milkman making his door-to-door rounds. April drives rather than walks, carries baskets instead of glass bottles, and never quite makes it around by sunup — but she delivers fresh goods to doorsteps, memorizes people and their orders, leaves full baskets, and comes back to gather empty ones. She knows the source of each product and delivers every Friday without fail. Max and April moved to North Carolina from Virginia Beach five years ago. In 2008, April completed the teaching program at the University of North Carolina at Wilmington and needed a summer job. So she set up a produce stand. She secured a teaching job in the fall but missed the camaraderie with the farmers. So she began a community-supported agriculture program and delivered boxes of produce every week. As the business grew, Max and April rented a building on South Lake Park Boulevard. With space to spare, they opened a traditional store component to complement their deliveries. Outside the store, April’s produce stand serves as a reminder of how they started. And no matter how big The Veggie Wagon becomes, no matter how many baskets April delivers, the Sussmans’ goal of creating a single stop for local products stays the same. These one-pound loaves are baked in Wilmington. The homemade blackberry and fig jam comes from Hamptonville. Made in Kure Beach, these cakes recognize the region’s pirate history. These treats are a Veggie Wagon original for pampered pets. This cheese comes from an 82-year-old creamery in West Jefferson. Glass bottles of milk come from a family dairy in Hillsborough. Amanda Munger was the features editor at The Robesonian in Lumberton. She now lives in East Dubuque, Iowa.